Rand Fishkin, founder of Moz, thinks that the case for long-form content is malarkey. Bunk. Mythical. Not so fast. One data-driven reason for long content posts is that they rank well on Google for several reasons we discuss. Rand emphasizes the need for content that solves problems as efficiently, enjoyably and authoritatively as possible. We agree. But are the two mutually exclusive? Can content that accomplishes what Rand suggests, and is also lengthy — because it needs to be — not only provide great information for consumers but also be found more easily on Google? We also take a look at a great little tool called SmartBribe that creates a series of “bribes” offering more “free” information if the recipient takes extra steps, such as a social media post or an email. The FBI said it had “accessed the data” on the device behind its Apple lawsuit, but did not say the data had been decrypted. Nonetheless, it dropped the lawsuit. Furthermore, the FBI has now agreed to help unlock the iPhone involved in an Arkansas case where a prosecuting attorney had requested their assistance. The LA Times published a fairly comprehensive Q&A about what the latest developments may mean. Steve Gibson of GRC has released Never10 to help users of Windows 7 or 8.1 prevent their machines from being upgraded to Windows 10. Microsoft’s data centers in Germany prevent even Microsoft from accessing cloud data there — not to mention the FBI or any other branch of the US Government. A new bill before the California Assembly (AB-1681) provides that any “…smartphone manufacturer or operating system provider of a smartphone sold or leased in California on or after January 1, 2017, that is unable to decrypted [sic] the smartphone pursuant to a state court order to be subject to a civil penalty of $2,500 for each smartphone sold or leased. instance in which the smartphone is unable to be decrypted. The bill would prohibit a manufacturer or operating system provider who has paid this civil penalty from passing any portion of the penalty on to purchasers of smartphones.” This bill hasn’t passed yet, but it’s been introduced in the current legislative session. 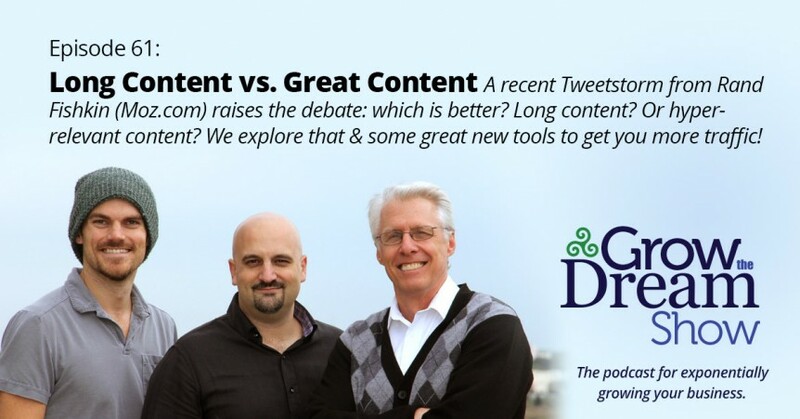 Not sure where the idea that "great content" = "really, really long content" came from, but we need to dispel that myth. The best content = delivery of the best answer as efficiently, enjoyably, & authoritatively as possible. Rarely is that a huge guide. Great content can be turning an "ultimate guide" into a few visuals and a few paragraphs to more effectively communicate the same thing. Data point: this tweetstorm will almost certainly have more views, amplification, & readers than if I'd made it a blog post. Opinions vary. Neil Patel reported on a study by CoSchedule on the average word count by search ranking, showing that posts with over 2000 words may not rank at the top (see #14 on this 17 SEO myths post of his). On the other hand, he argues that his own 3000+ word blog posts get more traffic than his shorter ones. We fumbled around looking for recent stats during the show, but in 2015, a Google spokesperson revealed that approximately 500 million, or roughly 15%, of daily Google search queries have never been seen before. This creates an opportunity for marketers to create content in anticipation of upcoming surges in search queries for specific topics. And then there’s the Chrome extension, Grammarly. Josh also told us about the startup DeepGram, which analyzes your audio and provides insights, transcripts, and more. After problems with iTunes not recognizing our Let’s Encrypt certificate, we went back to the inexpensive commercial certificate provider we’ve used in the past. If you need an SSL certificate, check them out. You’ll be supporting Grow The Dream Show if you make a purchase!